Carcassonne (Occitan: Carcassona) is a fortified French town, in the Aude département in the Languedoc. 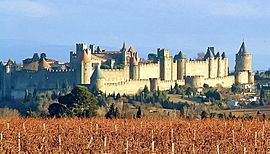 It is separated into the fortified Cité de Carcassonne and the more expansive lower city, the ville basse. The town is 90 km (56 mi) southeast of Toulouse in the gap between the Pyrenees and the Massif Central of France. 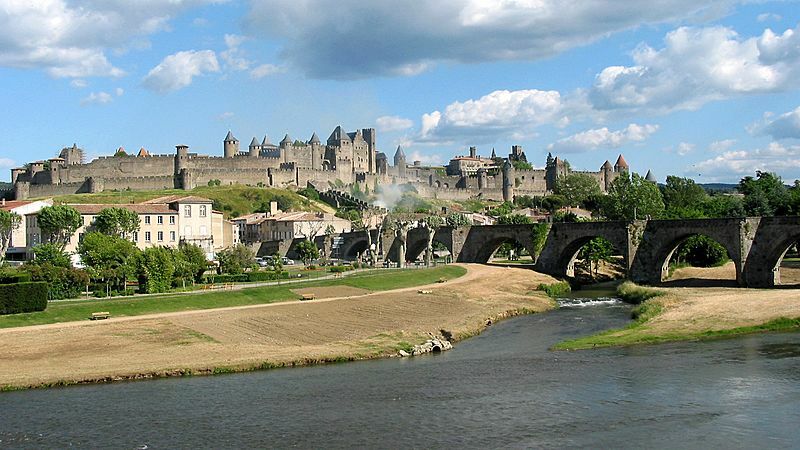 Carcassonne is at the crossing of two major traffic routes: the route leading from the Atlantic to the Mediterranean and that from the Massif Central to Spain, skirting the Pyrenees. Both routes exist since ancient history. The commune of Carcassonne has an area of 65.08 km2 (25.13 sq mi) and its average altitude is 111 m (364 ft); at the city hall, the altitude is 110 m (360 ft). The fortifications consist of a double ring of ramparts and 53 towers. 1849 the architect Eugène Viollet-le-Duc took over restoration works. At his death in 1879 his pupil Paul Boeswillwald, and later the architect Nodet continued the rehabilitation of Carcassonne. The restoration was strongly criticized during Viollet-le-Duc's lifetime because he made the error of using slates and restoring the roofs as pointed cones, where local practice was traditionally of tile roofing and low slopes, as in this region snow was very seldom. But today Viollet-le-Duc's work at Carcassonne is thought to be a work of genius, even if it is not exactly the same as it was. As of 2012[update], Carcassonne had 47,068 inhabitants for a density of 723.2 persons/km2. 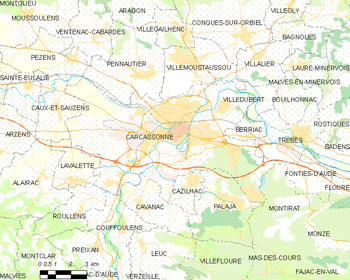 The inhabitants of this city are known, in French, as Carcassonnais (women: Carcassonnaises ). View of Carcassonne in the late 19th century. Carcassonne Facts for Kids. Kiddle Encyclopedia.